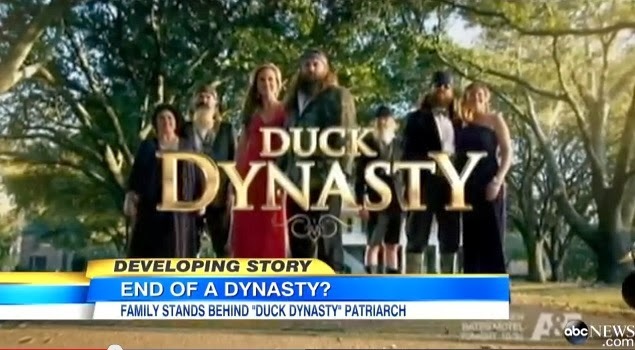 The fallout over A&E’s decision to indefinitely suspend the Duck Dynasty patriarch and star of the most popular show A&E runs, has come down on the television station like a ton of bricks. In caving to the pro-gay community who wishes to “reeducate” the more-than-ever popular star, and suspending Phil Robertson for comments he made in a GQ interview expressing his religious views on homosexuality, A&E is now receiving death threats, a Sheriff that has offered assistance in some of A&E location shows is refusing to assist again, Walmart shelves are being stripped by consumers of Duck Dynasty merchandise in support of Mr. Robertson’s right to free speech about his religious beliefs, boycotts are being started against A&E and their advertisers, the Duck Dynasty family is hinting they might not continue without him, and A&E is left standing alone. 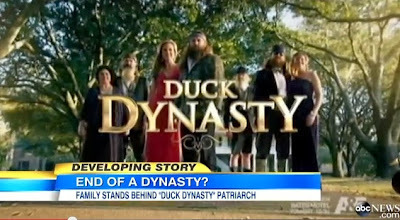 Rather than just the 14 million people the the show averages, free speech advocates, freedom of religion proponents, constitutionalists and those with the same believes as Phil Robertson has, are all standing with him, while the people standing with A&E are those that did not watch the Duck Dynasty show to begin with, which hailed themselves as bible thumpers since it’s creation. Even a gay CNN commentator is standing with Robertson’s right of free speech without being penalized for it. “Duck Dynasty”, the most popular show ever on cable television, takes place in and around West Monroe and helps drive the state’s tourism industry. If the show doesn’t continue, it would hurt the state economy, said Dardenne, whose public job includes promoting Louisiana tourism. “Regardless of one’s views on Phil Robertson’s statements, Duck Dynasty has been an important representation of the state of Louisiana, inspiring prospective visitors and investors since its debut. Their show draws tens of millions of viewers each year, reaching an audience eager to visit Sportsman’s Paradise,” said Dardenne, who will be running for governor in 2015. The family can simply tell A&E goodbye and take their 14 million viewers with them when they leave. Just a sample of the videos on YouTube give hint of how epic a mistake A&;E made.